Microsoft released new cumulative update KB3156421 for Windows 10 users. 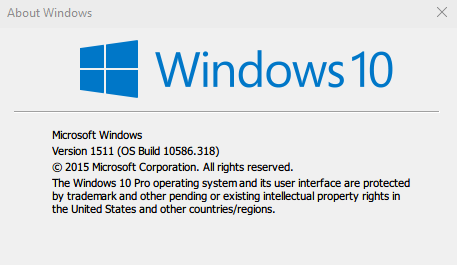 This update will push Windows 10 Build 10586.218 to Build 10586.318. Explorer 11, Microsoft Edge, Miracast, and USB. Fixed issue where user accounts weren’t locked out after a number of failed sign-in attempts. Microsoft Graphics Component, Internet Explorer 11, Microsoft Edge, Windows Shell, Windows Journal, Virtual Secure Mode, Schannel, and Jscript. Improvements for a reliability of internet connection sharing (ICS) and tethering. Check your Windows updates for KB3156421 and KB3157993. Users will see two updates named as Cumulative Update for Windows 10 Version 1511 for x64-based Systems (KB3156421) and Security Update for Adobe Flash Player for Windows 10 Version 1511 for x64-based Systems (KB3157993). Restart your system after installing updates. New Windows 10 version will be 10.0.10586.318. You can check it by pressing WinLogo key+R then type Winver.